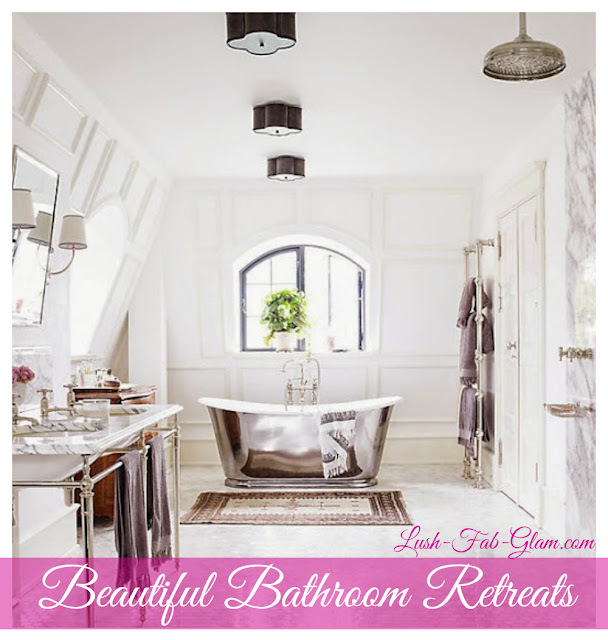 Lush Fab Glam Inspired Lifestyle For The Modern Woman: Home Decor: Beautiful Bathroom retreats. 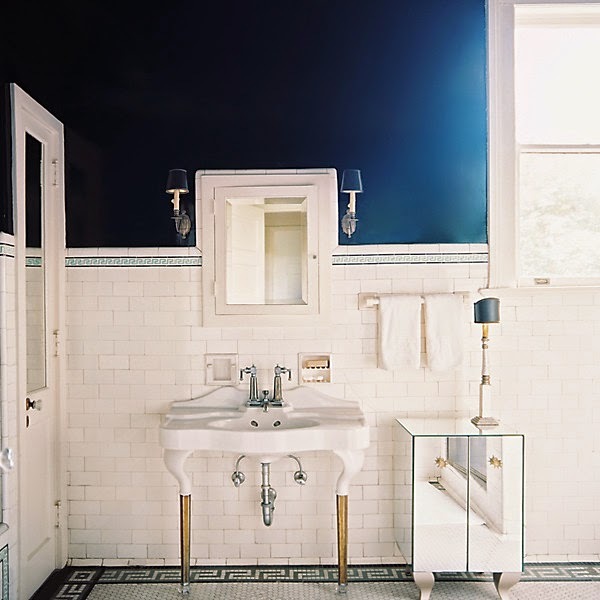 Home Decor: Beautiful Bathroom retreats. There is nothing like coming home to a warm and relaxing bath after a long, exhausting day. Especially during the cold fall and winter months. Designing a bathroom that invites you to relax, unwind, and stay a while is the perfect at home winter retreat! 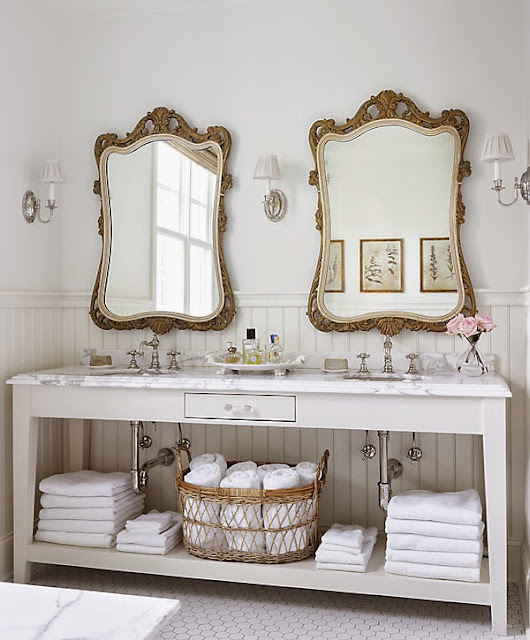 Beautiful Bathroom 1: Antique mirrors, scones, brass photo frames and a wicker storage basket add Victorian era glamour to this all white bathroom. Beautiful Bathroom 2: This all white farm house style bathroom is transformed into a light-filled with home spa with french windows, a claw foot tub, while the wood vanity and stools add warmth and much needed storage. Beautiful Bathroom 3: Marble is one of our favorite stones for bathrooms and this design spared no expense with floor and calacatta wall marble tiles in white, grey and gold. The addition of upholstered accent chairs, distressed vanities and a gorgeous chandelier and framed painting over the tub adds a regal touch. Beautiful Bathroom 4: Deep ocean blue walls are lightened up with white tiles and space is maximized with a free standing vanity and mirrored storage dresser. 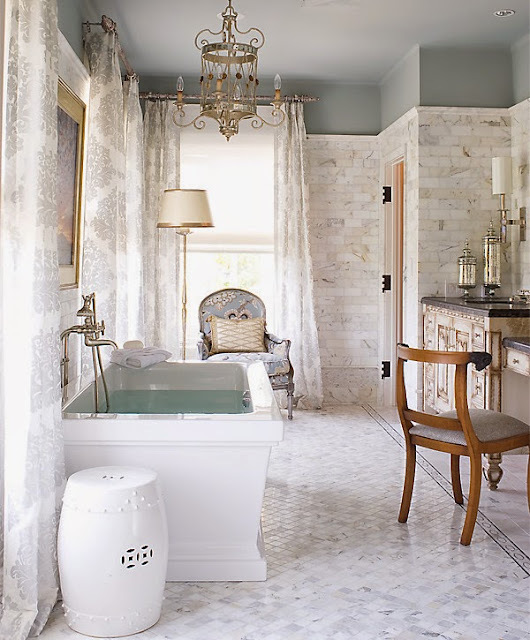 Beautiful Bathroom 5: We saved the best for last and this gorgeous bathroom needs no description but we are head over heels with everything from the marble floors and walls to the ceiling mounted rain shower. The gorgeous stainless steel vanity and towel holder and the piece-de-resistance that amazing white and silver tub. It's truly a beautiful bathroom retreat. Which featured bathroom design do you love? Share with us by leaving a comment below. It is an irrefutable fact that the bathrooms in a house need a renovation and redesigning after every two years as they become quite messy over time. Looking forward to get some fresh bathroom Leeds ideas for refurnishing my bathroom.